Construction is set to begin Monday, July 16, on improvements for the intersection where Fairview Avenue N. meets Fairview Avenue E. at the southern end of the Eastlake neighborhood (see map). Work on the project is expected to be completed by Aug. 3, although that schedule might slip, according to the Seattle Department of Transportation. From July 23 to Aug. 3, Fairview E. will be closed while work on realigning the intersection is under way. Pedestrians, bicyclists and vehicles will need to use alternate routes. This section of Fairview is part of the Cheshiahud Loop Trail around Lake Union. Making improvements to the intersection, which is known for speeding vehicle and dicey crossing for pedestrians, has been a priority for the Eastlake community since the 1990s. Funding for the project was obtained in September 2010 and a community open house took place in October of that year to hear preliminary plans. Squaring up the intersection to reduce the crossing distance for pedestrians crossing Fairview Ave E.
Reducing the southbound lane width of Fairview Ave N.
Adding bicycle facilities along Fairview Ave N.
A 6-foot asphalt walkway will be built on the waterside of Fairview E. as part of the Cheshiahud Loop Trail. 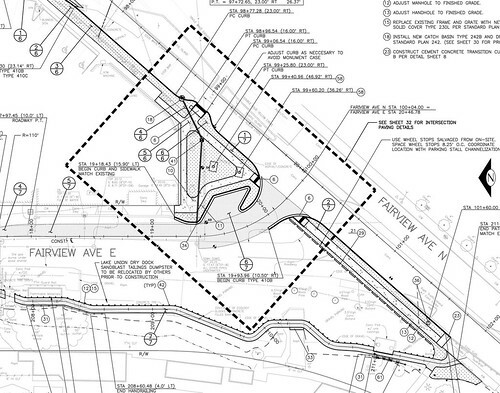 The SDOT website shows a map of the project area (see attached PDF) but no drawings of the final design. I’m asking the city for more information. SDOT says construction will run from 7 a.m. to 6 p.m. Monday through Friday. 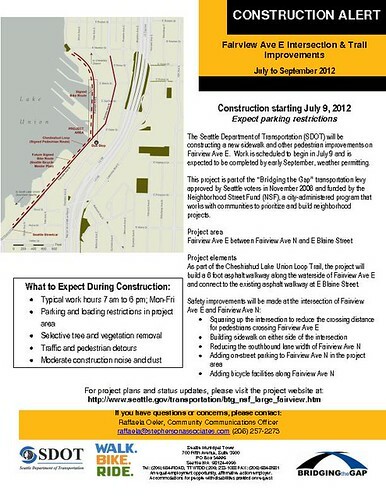 There will be parking and load restrictions in the area during construction. Update: This post has been updated since it was first published. The year when funding was obtained has been corrected. This entry was posted in Uncategorized on July 15, 2012 by cdmilton.